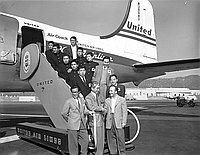 Group of wrestlers arrive from Japan at airport in California, February 1955. A Caucasian man and Japanese man shake hands at the base of ramp stairs in front of rear of United Airlines plane on runway. Group of men stand on stairs, including six in mandarin collar school uniform. Typed on original negative envelope: Wrestling Team from Japan.